April is Esophageal Cancer Awareness Month! This month we've partnered with The Sagli Esophageal Cancer Research Foundation! We spoke with the President of the Foundation, Linda Molfesi to learn a little more about her organization and their mission. Check it out! What is the impact of esophageal cancer in our society, and how is The SALGI Foundation helping? Esophageal cancer is one of the fastest and deadliest cancers in the United States, with over a 600% increase in the past decades. Gastroesophageal Reflux Disease (GERD), of which heartburn is a common symptom, is one of the primary risk factors for esophageal cancer. Unfortunately, many are unaware that heartburn and GERD could increase the risk of esophageal cancer. Also, symptoms, such as difficulty swallowing, often appear too late, once the cancer has progressed. There are also no routine or standard screenings to improve early detection. To make matters even worse, research is critically underfunded and awareness of these facts are limited. These factors contribute to the overall five-year survival rate being only 4.5%. The Salgi Esophageal Cancer Research Foundation was incorporated in 2011. Since then, the charity has raised national and international awareness of risk factors, symptoms and the importance of early detection. In 2015, the charity awarded its first grant to esophageal cancer research. What motivated you to start The SALGI Foundation? I, along with my daughter, founded The Salgi Esophageal Cancer Research Foundation in 2011. I know all too well the devastation that esophageal cancer brings, as I lost my father to it almost nineteen years ago. Years later, I had my own scare when I began to experience similar symptoms as my father and scheduled a test with a gastroenterologist. Thankfully, my results showed that I had some slight damage from the reflux but nothing precancerous. This prompted my daughter and me to begin researching heartburn and esophageal cancer. We were shocked to learn that since his passing, esophageal cancer had skyrocketed over 600% and has become the fastest growing cancer in the United States. Why do you feel it is important to give back to this cause? Esophageal cancer lacks public awareness of risk factors and symptoms; we’ve mentioned that there are no routine or standard screenings to improve early detection and research is critically underfunded. When The Salgi Esophageal Cancer Research Foundation was first formed, we learned that other charities did not give enough, and some not at all, to esophageal cancer research. Why is the month of April special for The SALGI Foundation? April is Esophageal Cancer Awareness Month. While raising awareness and research funding for esophageal cancer is something that we do all year long, April is a special time to rally together and make a difference. This year, in addition to working with Bravelets to raise awareness and funding for esophageal cancer research, The Salgi Esophageal Cancer Research Foundation has published a video slideshow honoring all the brave men and women who have been affected by esophageal cancer. All month long, we are promoting periwinkle which is the official color for esophageal cancer awareness. We encourage our supporters to utilize the power of social media to post, share and include the hashtags #EsophagealCancer #EsophagealCancerAwareness and the special hashtag that The Salgi Esophageal Cancer Research Foundation created, #AllPeriwinkleEverything™. On Sunday, April 30th, the 1st Annual Billy Bob Trot- Esophageal Cancer Awareness and Research will be held in St. Louis, Missouri. We are very excited and grateful to our wonderful supporter for hosting this event. We are also getting ready for Rhode Island’s 6th Annual Esophageal Cancer Walk/Run scheduled for June 2017 and looking forward to working with more supporters to bring these Esophageal Cancer events across the country. What do you think sets this non-profit apart from others? As a grassroots nonprofit, The Salgi Esophageal Cancer Research Foundation utilizes every tool available to bring this mission to as many people as possible around the globe while devoting as much of the donations received to esophageal cancer research. We have been fortunate to be able to keep overhead costs low and use free to low cost tools, like the internet, to raise awareness and encourage early detection. As we’ve mentioned, esophageal cancer research is critically underfunded. Since The Salgi Esophageal Cancer Research Foundation first funded esophageal cancer research in 2015, over 20 medical researchers have asked to be considered for future funding opportunities. It is our goal to again fund research this year. Our mission is simple but life-saving: awareness, early detection and research. Why do you think it is important to be brave? The bravest thing that we could have done was to establish this charity. The hardships and obstacles that we have faced as a nonprofit is nothing in comparison to the terrifying diagnoses of esophageal cancer that people receive each day and the difficult struggles that come along for not only them, but the people that love them as well. It is not easy to be brave, but sometimes in life, you have no other choice. The Salgi Esophageal Cancer Research Foundation finds inspiration from our supporters to continue to be brave. What is the best way to support someone facing esophageal cancer? Love and support them whether it be by lending an ear, a shoulder or a helping hand. Most importantly, treat them as you normally would. We’ve heard time and time again that they just want to feel “normal.” This is still the same person that you know and love. Be there for them and be brave for them in the moments that they are not able to be brave. "Too many people have lost their lives to esophageal cancer and there is still a great deal that needs to be done to change the statistics to save lives. No deed or action is too small when it comes to making a difference for esophageal cancer. We at The Salgi Esophageal Cancer Research Foundation welcome anyone who is interested in learning how they can get involved to contact us." Through the end of April 2017, you can donate 20% of your purchase to The SALGI Esophageal Cancer Research Foundation with code: SALGI20 at checkout. 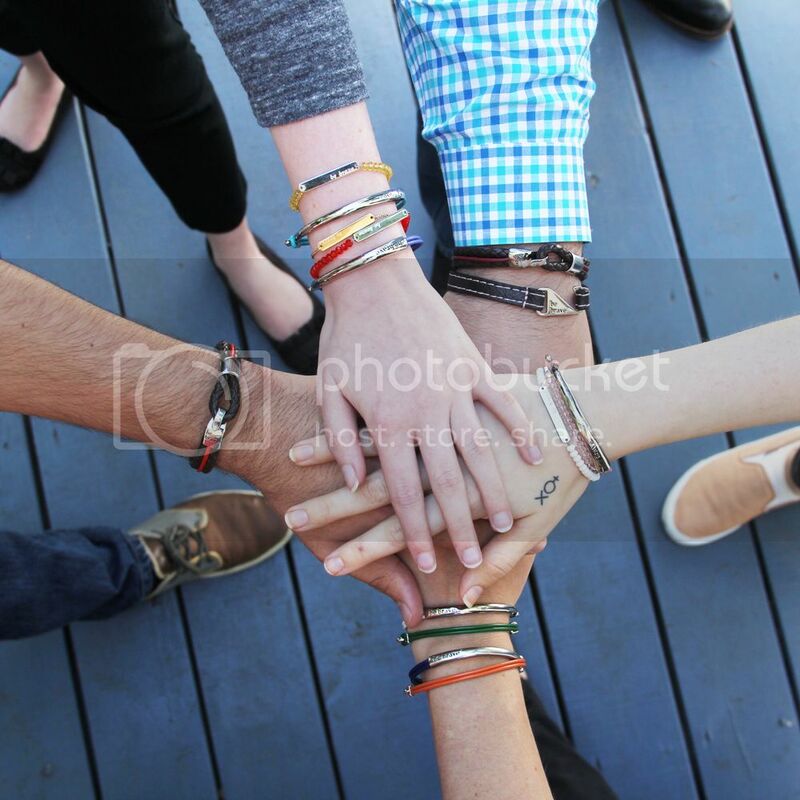 Visit their Bravelets Brave Page here. To learn more about The SALGI Foundation and mission, visit their website here. Esophageal cancer is really a big problem and it's so sad that this disease is one of the fastest and deadliest cancers in the United States. I'm very happy that you decide to start The SALGI Foundation and help people to fight with cancer. I think, I'll order an essay on this topic and bring this information to the circle of my acquaintances. That is a wonderful idea, Crystal! If we can be of any help, please let us know!